Abstract: Since the widespread adoption of coherent optical detection, a large number of modulation schemes have been proposed for optical transmission systems. In this seminar, we will discuss the recently proposed “high-dimensional modulation” formats, and their advantages over the traditional 1-D, 2-D and 4-D modulation formats. Biography: David S. Millar earned an M.Eng. in Electronic and Communications Engineering from the University of Nottingham in 2007. In 2011, he received a Ph.D. in Electronic and Electrical Engineering from University College London (UCL), for research on DSP for coherent optical fiber transmission. From 2011-2012, David was a postdoctoral researcher at UCL, before joining the Optical Communications team at MERL. Since then, he has been working on next generation systems and subsystems for the physical layer. He is particularly interested in advanced modulation formats, forward error correction, and algorithms for equalization & carrier recovery. 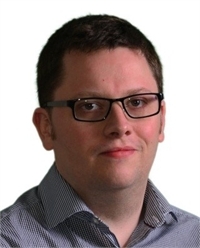 Dr. Millar is a member of the Technical Program Committee for OFC 2015, and a reviewer for several publications of the IEEE and OSA.